The owner of this photograph says she detected human remains in the shot three months after it was taken. 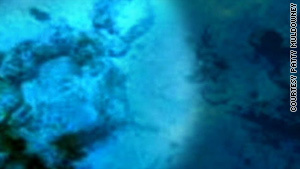 (CNN) -- An Aruban police dive team will search the site where an underwater photograph was taken that might show human remains, a spokeswoman for the Aruban prosecutor said Saturday. The picture has renewed interest in the nearly 5-year-old Natalee Holloway case. "We have received the picture, and the diving team of the Aruban police will start doing preliminary work at the spot where we believe it was taken," Angela told CNN. She declined to identify the location, saying authorities want to avoid attracting onlookers during the search. The picture has raised the notion that, if it shows human remains, they could be those of Holloway, an 18-year-old Alabama high school student whose 2005 disappearance while on a graduation trip to Aruba was widely publicized. Holloway was last reported seen leaving a bar in the capital of Oranjestad on May 30. Video: Natalee Holloway bones found? CNN could not independently verify the authenticity of the photo nor confirm whether it shows human remains. Holloway's mother, Beth Twitty, declined to comment on the photo. The photo was taken by a Pennsylvania woman using a disposable film camera during the first stop on her Royal Caribbean cruise. Three months after snapping what she said she thought were pictures of colorful fish, Patti Muldowney and her husband said they realized that one picture contained what they believe appear to be human remains. "When I looked at that photo, I said, 'By darn, that certainly does look like a skeleton,' " John Muldowney told HLN's "Nancy Grace" on Friday. "You can see the skull. You can see where the eye sockets were. You can see where the chin was. "It's lying flat on its back. And its arms are cradled around. You can almost see fingers. And then on the one sleeve it looks like some kind of maybe clothing that's deteriorating." The couple, who took the photo to police and the FBI, said it was taken near a shipwreck. The FBI said Friday that it is investigating. "The photo has been made available to all elements of the FBI that are involved in this foreign police cooperation case," Mike Kortan, assistant director of the FBI's office of public affairs, said in a statement. "Investigative leads are being pursued and the effort is ongoing." The main suspect in the Holloway case, Joran van der Sloot, remains free. Van der Sloot has made alleged confession-like statements in TV interviews, one of which involves dumping Holloway's body in the ocean after she suffered a seizure on the beach. Aruban judges have ruled there isn't enough evidence to arrest him. Whether the object in the photo is human remains is still up for debate. In underwater burials, it is typical for arms, legs and other extremities to be dispersed and for lighter bones to be carried away from heavier bones by fish, wildlife and water, according to Heather Walsh-Haney, a forensic anthropologist. "It looks as if there's something that may be on top of the skeleton," Walsh-Haney said of the image in the photograph. "That would certainly bode well for preserving the center of the mass of the body and keeping most of it there." Dr. Marty Makary, a physician who serves on the faculty at Johns Hopkins School of Public Health and School of Medicine in Baltimore, Maryland, said he sees mixed signs, some indicating the image may not be a skeleton. "What I don't like about the photo is there's no spinal cord or vertebral column," he said. "In fact, below this roundish skull-type profile you see a curvature which doesn't really represent a normal spinal column." CNN's Tracy Sabo and Philip Rosenbaum contributed to this report.